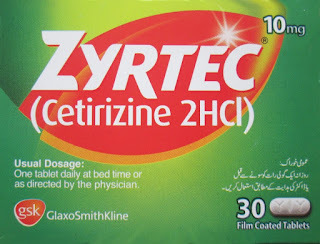 Zyrtec is produced by GSK, which contains Cetirizine. It is being used for the relief of nasal and ocular symptoms of seasonal and perennial allergic rhinitis and symptoms of urticaria and conjunctivitis plus pruritus diseases. Zyrtec for kids is the best medicine for seasonal allergies. 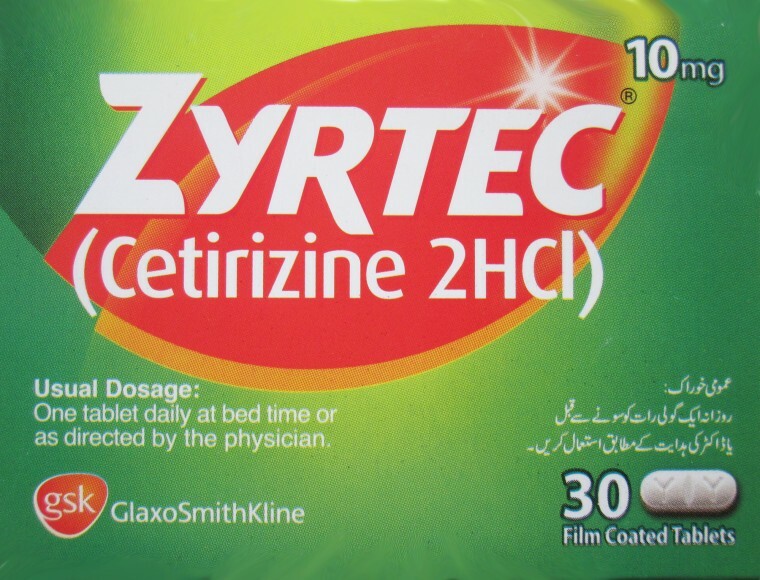 Zyrtec actually reduces histamine in the body, which produce symptoms of itching, sneezing and runny nose. Symptoms includes Sneezing, Rashes, Runny Nose, Flu, Nasal Congestion, Allergy, Itching, Fever etc. Contraindications: Cetirizine is contraindicated in patients with history of hypersensitivity to any of constituents of formulation to hydroxyzine or to any piperazine derivatives. Precautions: Precaution is recommended for alcoholic person. Tablets are not recommended for children aged less than 6 years while syrup is also not recommended for children less than 1 year. Caution should be exercised when prescribing to pregnant and lactating women, because cetirizine is excreted in human milk at concentrations representing 0.25 to 0.90 those measured in plasma. Adverse Reactions: Some common and rare adverse reactions of cetirizine contain diarrhea, rashes, paraesthesia, confusion, depression and weight gain etc. every morning when i wake i have a severe cough and phlegm, why is this happen on regular basis i am not a smoker, not uses cold water never eat or drink that causes sickness, same condition happens with my 4 years old daugther, i am 33 years old. kindly help me. Sir, I am Catching Flu On Regular Basis In Winter. Using Antibiotics HElps Me And After A Few Days I Get Flu Again…. Please Help Me..